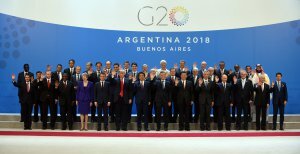 G20 leaders opened annual talks on Friday stalked by the deepest divisions since their first summit 10 years ago, with US President Donald Trump under fire for destroying the group’s past consensus on trade and climate change. Russian President Vladimir Putin, under pressure himself after his security forces seized three Ukrainian ships, set the tone by condemning the ‘vicious’ use of sanctions and trade protectionism. The target was clear, as Trump – who cancelled a planned meeting with Putin in Buenos Aires – tears up the stability promoted by the G20 powers when they first convened in November 2008 in the grip of financial crisis. Putin’s attack, and similar criticism of Trump’s isolationist stance by French President Emmanuel Macron, capped an incident-packed build-up to the G20 that included flare-ups over Ukraine and Saudi Arabia. Putin grinned broadly and welcomed Saudi Crown Prince Mohammed bin Salman like a long-lost friend with a high-five ahead of a group photo where Trump stood grimly. The summit marks a quick return to the international stage for the Prince Mohammed after the kingdom came under fire for the killing of journalist Jamal Khashoggi in its Istanbul consulate. May told British media she intended to use the summit to sell the vision of a ‘global Britain’ after its Brexit departure from the European Union, scheduled for March next year. EU president Donald Tusk was more focused on the Ukraine crisis, saying at the G20 that he was ‘sure’ the bloc would roll over its sanctions on Russia next month. On the G20 front, Tusk admitted the world was undergoing a ‘difficult moment’ overall, as Trump pursues a vision at odds with the idea of collective action on trade and climate change. The same disputes were hobbling adoption of a G20 communique, observers said. One French source said Macron was trying to build an anti-Trump front with a separate statement embraced by ‘progressive countries’. With a major UN meeting on climate change starting in Poland straight after the G20, UN chief Antonio Guterres said in Buenos Aires that ‘this is a make-it-or-break-it moment’. The US president began Friday with another Twitter blast defending his past property dealings in Russia, again denouncing the investigation as a ‘witch hunt’, a day after his ex-lawyer pleaded guilty to lying to Congress over the affair. On the G20 margins, Trump scored one victory for his ‘America First’ agenda with the signing of a successor to the North American Free Trade Pact (NAFTA), the US-Mexico-Canada Agreement (USMCA). Although the new pact inherits key features from the old one, Trump has declared it a victory for the US workers he claims were cheated by NAFTA and on Friday called it the most ‘modern and balanced agreement in history’. ‘This is a model agreement that changes the trade landscape forever,’ Trump said at the signing ceremony in Buenos Aires. The president has also ignited a trade war with China, and will dine with President Xi Jinping on Saturday after the G20 summit concludes. But Trump, arguing controversially that his trade tariffs are paying off, says he may now not want a deal with Xi, even if world markets certainly hope for one to defuse the conflict between the world’s two largest economies. 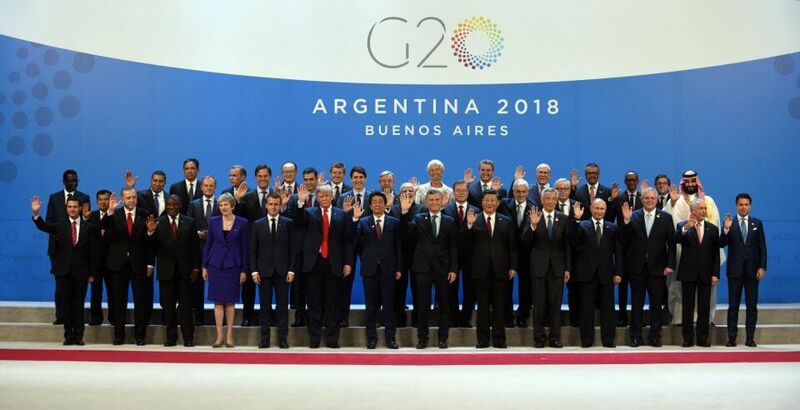 The G20 summit is the biggest international gathering in Argentina’s history, but comes at a bad time for the host country as it endures a crippling economic crisis. Protesters have vowed a mass rally later Friday, underlining security concerns after recent football violence forced the relocation of a showpiece final to Spain. But the government is vowing zero tolerance of any unrest, and declared a public holiday for Friday, shuttering the metro system and keeping the normally choked roads largely free of traffic. ‘We are in a bad situation, and we’re putting a pile of money into this? Everything’s high security. It’s strange to see everything so empty,’ she said.